Arianna might be a princess, but she's grown up being viewed as purely a tool for the king's use. Mocked, belittled, and humiliated she seeks refuge in the forbidden rooms that used to be her mother's. When she finds Bolthorn, an orc trapped in a magic mirror, Arianna is struck by his strength and his sense of honor. And she begins to see a glimmer of hope that perhaps they could save each other. But escaping the castle could only be the beginning of all their troubles. Do they have enough faith to survive or will their differences shatter any hope of freedom? Yesterday Amalia Dillin's new book Honor Among Orcs came out and if you haven't, you should definitely pick it up, add it to your TBR pile, and get to it as quickly as possible. I reviewed her book Forged by Fate last year, and I was ecstatic to have the opportunity to be an advance reader for Honor Among Orcs. I met Amalia via Twitter several years ago and have loved following her as she has gotten published and moved forward in her writing career. But instead of just reviewing the book, I thought it would be fun to get to know Amalia a little bit better as well. So first I give you five things you might not know about Amalia Dillin. 1. If you had to tweet a summary of your book what would it be? Tolkien meets Beauty and the Beast when Princess Arianna finds an orc trapped inside a magic mirror in HONOR AMONG ORCS! 2. Where did you get the idea for Honor Among Orcs? There's a line in the Silmarillion which says that the orcs were elves once, before they were stolen, and essentially tortured into their current form - the idea just captivated me, especially combined with the concept of the half-orc. I kept thinking, under what circumstances might a human woman and an orc get together WITHOUT violence or assault? Honor Among Orcs is kind of my answer to the combination of those two ideas! 3. Can you tell us a little bit about your publishing journey for this book? Rebecca T here - I am so glad you pursued self-publishing because the thought of never getting to experience this book saddens me immensely. It's amazing and I think Bolthorn and Arianna just might be one of my favorite book couples ever. 4. If you had to pick one, what book or author do you think was most influential, either to you as a writer or to the development of this book? Tolkien, for sure, as the most influential for Honor Among Orcs. But I think Tolkien is kind of the answer for a LOT of high fantasy! We owe a lot to him as an inventor of the genre. I'm not exactly a Lord of the Rings devotee, but I really admire his work as a reinvention and creation of a mythology for Britain. He's pretty much amazing. Honor Among Orcs plays a little bit with Norse Mythology too, so we have that in common, as well. Oh man. It is a tie between cookies and chocolate pudding. Particularly home made chocolate chip cookies. I spread the dough as a big sheet and bake them kind of like a brownie, then I cut them into bars, and they are maybe the best cookies in the history of cookies, imho. But cook and serve chocolate pudding, with that awesome skin on the top after it cools a bit - I have so many fond memories of making it with my grandmother and there's just nothing else like it! 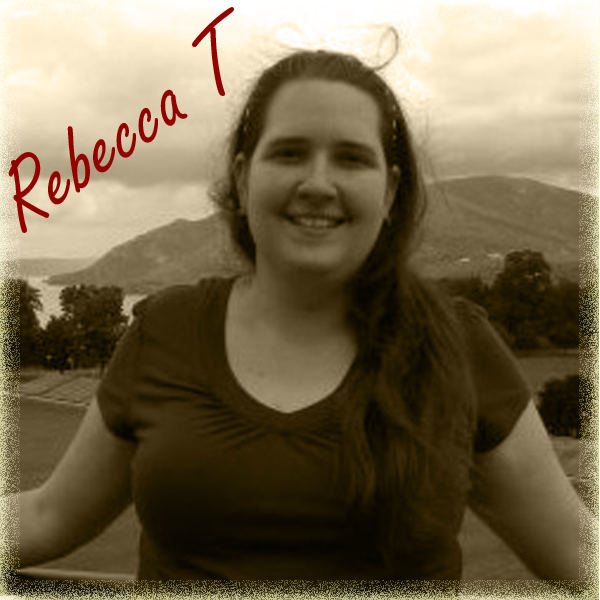 Rebecca T here again - I concur. I love pudding skin and never understood people who thought it was gross! So there you have it - 5 fun facts about Amalia. 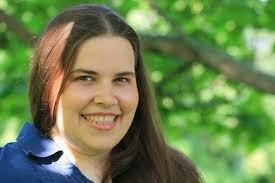 You can follow her on Twitter or Tumblr, like her author page on Facebook, become a fan of her on GoodReads, or check out her blog to keep up with new projects she has coming up. Or just because she's a pretty cool person. Now for 5 things I loved about Honor Among Orcs. I may have a hard time keeping this to just five, but here we go. 1. The Premise. As Amalia mentions above, there is definitely influence from Tolkien, but this is not a Tolkien story either. I love the way the orcs are constantly yearning to return to their "true" forms as elves and how that impacts the behavior, politics, and decisions which in turn affect both Arianna and Bolthorn. 2. Arianna and Bolthorn. Like I said above, I think the two of them are so well drawn. There is an amazing development of the relationship between these two characters, yet they are defined in and of themselves as well. And there is a moment in the book where I was actually sending Amalia threatening e-mails if she dared to do what I thought might happen. Prepare to get invested in these characters' lives! 3. The World. I know this is connected to the premise, but the crafting of the world that the characters live in is so vibrant. I could envision everything from the castle where Arianna is all but a prisoner to the forest to the mountaintops. It all comes to life in Amalia's deft style. 4. The Supporting Cast. Vana, Fossegrim (how much do I love him?! ), Eistla, Hyndla, Bolvarr - the whole group of secondary characters is as wonderfully drawn and I am yearning to know what happens with them in the next book. 5. It has a little bit of everything. There's fantasy, romance, magic, mythology, political manipulation, danger, intrigue - everything you could want in a book. 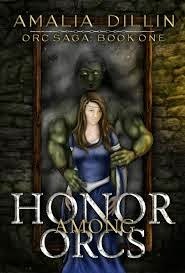 So go find yourself a copy of Honor Among Orcs! I'm sure you won't regret it. Labels: 10 things, Amalia Dillin, book review, Fantasy, Rebecca T.